It is difficult to play a righty guitar left-handed. On an electric guitar, it is challenging because you need to restring the guitar and flip it upside down, so the body could poke into you or otherwise be uncomfortable. But on an acoustic it is much harder. That’s why you need to buy the best left-handed acoustic guitar for your budget. The reason is because those reinforcing strips of wood in an acoustic to preserve the life of the instrument and ensure it will last through a lot of playtime. Because of the location and design of those strips, it is essentially impossible to play a right-handed guitar lefty. So you must look for guitars for left-handed players from the beginning. After reviewing and testing several left-handed acoustic guitars, the best value is in the Martin LX1EL Little Martin Left Handed Electro Acoustic Guitar. 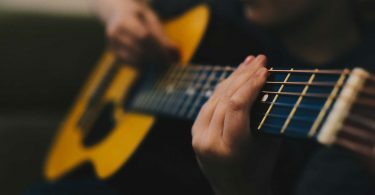 It’s a great little guitar with a lot of tone and some useful features, but first, you need to know what to look for in a left-handed acoustic guitar. Composite design. The combination of a sitka spruce top and mahogany back and sides creates a beautiful sound worthy of the Martin name. It is deep, rich, and warm without weighing down the instrument. The author has been playing the guitar for years and evaluating guitars of different types for nearly that long. While she is not a lefty, she has a left-handed friend who plays acoustic guitar. She helped her determine the particularly important aspects that lefties need out of their acoustics. She also play tested some of the guitars on this list. The author put in a lot of time and thought into finding the best guitars for left-handed players. It is difficult to find a good lefty guitar and frustrating to miss out on such a big part of the market. This guide is for the less experience guitarist. 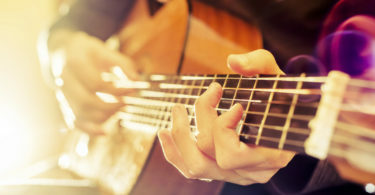 There are certain features to look for in a left-handed acoustic guitar. Here are the important characteristics to keep in mind when you shop for one. It’s important to look at the type of wood that makes up the guitar. Each wood, or combination of woods, creates a different sound and tone. Guitars can have different woods in the body and the neck, and generally the body is more important in terms of tone. Wood also determines the appearance of the guitar, although that is obviously not as high a priority as tone. Lastly, wood can affect the weight of the guitar, which can significantly change how the guitar feels to play. Woods fall into two types: hardwoods and softwoods. It is common for luthiers to use a mix of the two to get a balance of tone and weight. In general, alder provides great mids and lows with some sustain. Ash provides more sustain and a better high tone. Basswood is well-balanced and strong throughout the spectrum. Korina is known for sustain, detail, and lightness. Mahogany is warm, deep, and balanced. Maple is bright and appealing, but it tends to be heavy. It is common to mix maple and mahogany to get a medium-weight guitar with a great overall sound. Poplar has balance, but the tone is not particularly attractive yet it is inexpensive. Rosewood is extremely bright and borders on being too bright, and it is also heavy. Walnut has a tone like mahogany, but with a little more grip in the bass notes. There are other woods, but these tend to be the most common ones for guitars. Even if you are not convinced about buying a particular guitar, find some examples with different common wood combinations to try out in person to see how they differ. That can help you narrow down your choices because you can hear the difference and get a feel for what each wood is like. Don’t feel bad about making your decision in part on appearance, either. You should be happy with your instrument in all its details. 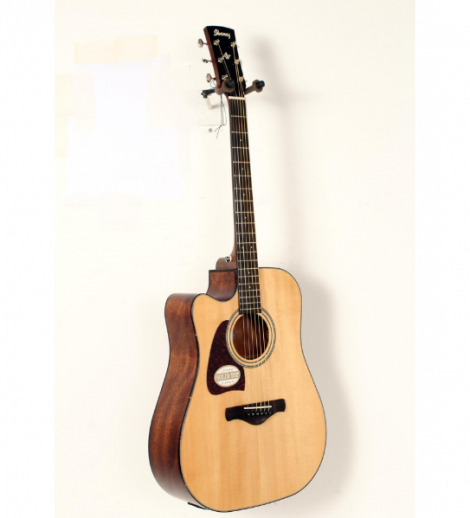 The price for a quality acoustic guitar can vary, so make sure you get exactly what you want for a good price. There are a lot of factors that play into the price of a guitar. A higher price usually means higher general quality. That includes things like more care in putting the instrument together, better materials and more effort in the design. This can hit a point of diminishing returns, however, when all you need is a guitar that can play well. It doesn’t need a detailed inlay or elaborate finishing work to sound good. The quality of the wood does matter, though. Some woods are more expensive than others, and even in the same species, the location matters. It might be worth it to spend a little more to ensure you know the wood is from a good source. This is about durability as well as tone. Usually a left-handed acoustic guitar with a more detailed and careful assembly process will cost more. Even ingredients like glue can make a difference. Think about the key attributes your dream guitar must have and make a list of options you can live without. That will help guide your search and show you what you can sacrifice, so you can still meet your budget. You need to go into a shopping trip like this with a budget and stick to it. It is too easy to get excited and overspend on musical gear, so discipline will make a big difference in what you eventually shell out. The limited selection for lefties does mean you might wind up paying more than a right-handed friend with a similar feature list, but that doesn’t mean you can’t get good value. The limited selection for lefties does mean you might wind up paying more than a right-handed friend with a similar feature list, but that doesn’t mean you can’t get good value. 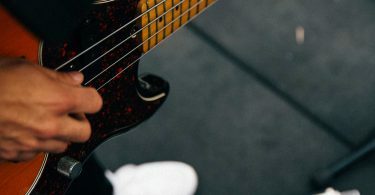 Fingerboard: The fingerboard can look and feel quite different from one guitar to another. Although it depends on the wood and the finish, other things also play a role like the size of the frets and the bridge. 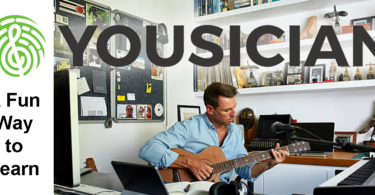 Ease of Use: You also need to think about how easy the guitar is to work with. Do the tuners turn easily? Is the strap tight and secure? 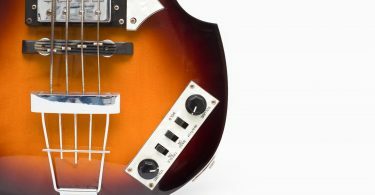 These questions can be a concern with older or used guitars. Amp Hook Up: Think about whether you have any interest in being able to hook up your guitar to an amp at some point. Most acoustic players won’t use this feature much, but it could come in handy in a secondary guitar. The top pick for a lefty is the Martin LX1EL Little Martin Left Handed Electro Acoustic Guitar. 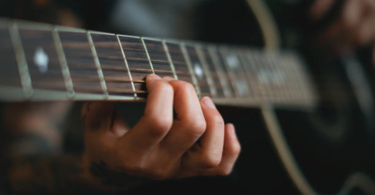 As the name implies, it is an acoustic guitar with electric capabilities, meaning that it has a port for you to connect it to an amp. The guitar itself is a composite design. The top is made of sitka spruce and the back and sides are mahogany. That combination creates a beautiful sound worthy of the Martin name. It is deep, rich, and warm without weighing down the instrument. The neck consists of stratabond with a fingerboard of richlite. The Martin has 20 jumbo frets and chrome tuners. It has a set of Fishman Isy T pickups. But what makes this guitar such a great choice is its versatility. For about $500, you get the ideal acoustic gig guitar. The ability to hook it up to an amp lets you bring its tone to a venue-sized space. It comes with a gig bag for protection and safekeeping during travel. If you are not interested in playing through an amp, the unplugged tone is excellent on its own. It’s a flexible choice whether you are playing at home or on the road. So even though it costs a little more than some other options, it means you won’t need to buy a second road instrument. 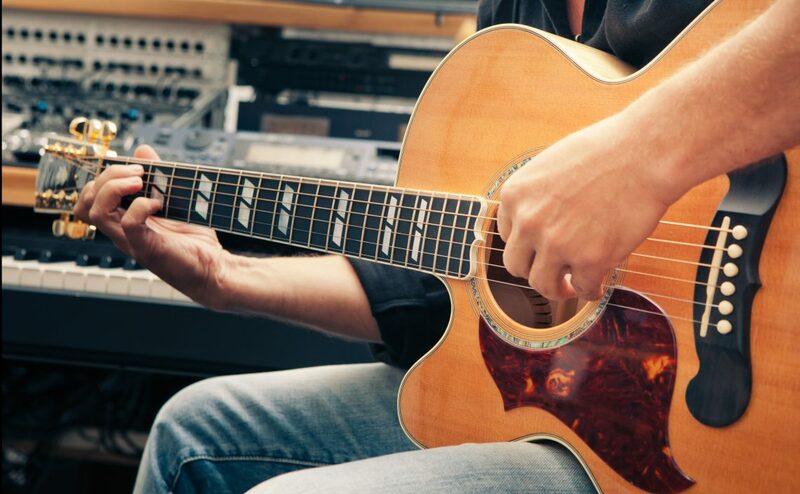 In second place for a left-handed acoustic guitar is a more affordable, accessible option. 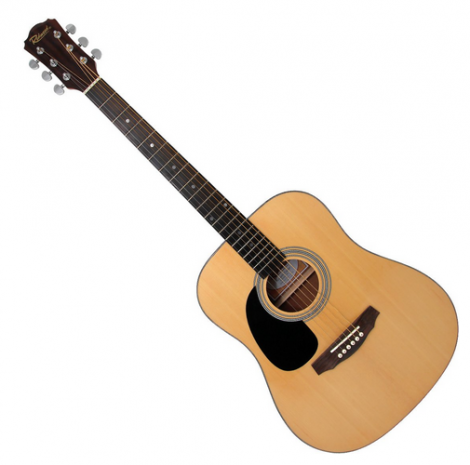 The Redwood RD100 Left Handed Acoustic Guitar costs just about $125. It uses the “dreadnought” body shape, which is rounded and symmetrical. Like the Martin, it has a spruce top and mahogany body. That’s a good tonewood combination. You will probably see it a lot because the sound spruce and mahogany creates is suitable for a wide variety of genres. This is an inexpensive generalist guitar. The fingerboard and bridge consist of sonokelin, and the fingerboard has a pearl inlay. The cost savings comes from a slightly lower quality of wood and the lack of electronic elements. This guitar is more suitable for home play than travel. 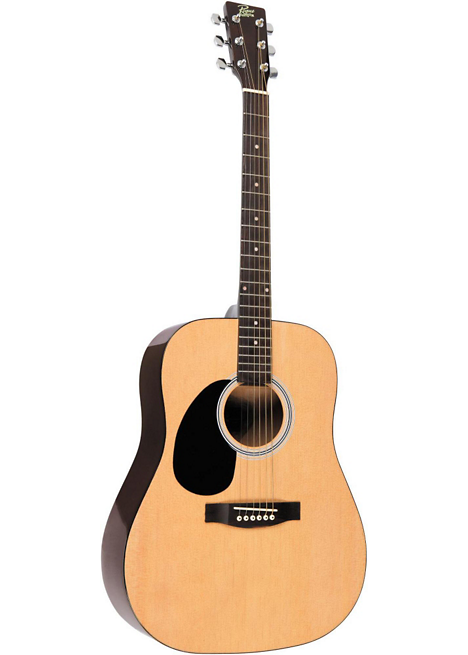 For an even more budget friendly choice, consider the Rogue RG-624 Left-Handed Dreadnought Acoustic. It only costs about $90. It has the familiar spruce and mahogany construction with a rosewood fretboard. You’ll get a sound that is equal or better than what you will hear out of a significantly more expensive left-handed acoustic guitar. You get a lot of value out of the Rogue and it is perfect for those with little guitar playing experience. 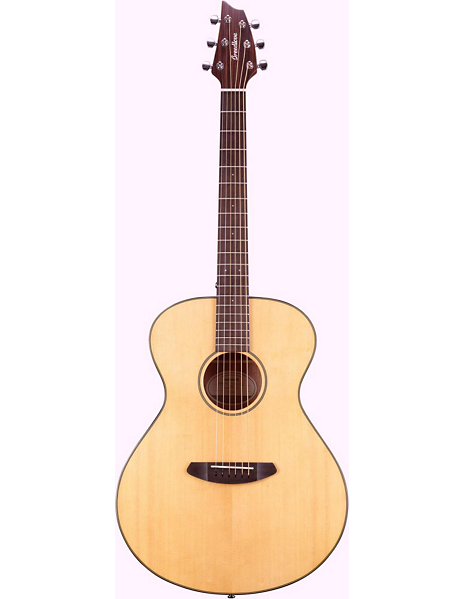 Next, consider the Breedlove Discovery Concert Left Handed Acoustic Guitar. It is another spruce and mahogany build, but this one has a concert body design instead of dreadnought. The difference is a narrower “waist” that gives the guitar a different feel, as well as changing the sound. This model costs $300 and is of somewhat greater quality compared to the Rogue. It has the flexibility to play it fingerstyle or with a pick, too. 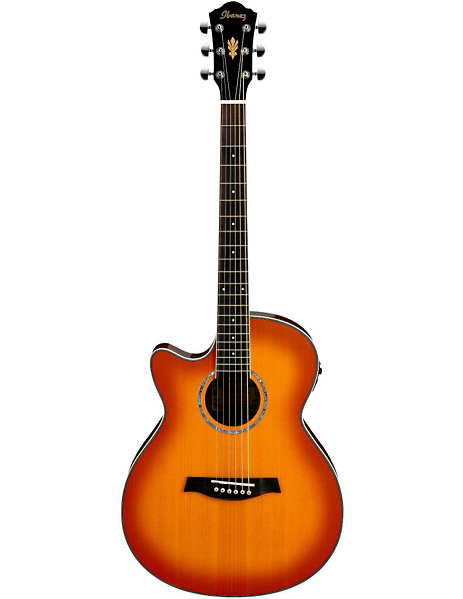 The Ibanez AEG18LII Cutaway Left-Handed Acoustic-Electric is another example of a left-handed acoustic guitar you can plug into an amp for bigger output. It has a new design, a cutaway where part of the body near where it will rest against your torso. This can make the guitar more comfortable and also alter the sound, because the resonating space inside the body has changed shape. The design is beautiful with a sunburst finish. It is mahogany and spruce. The Ibanez AW400CENT Artwood Solid Top Dreadnought Left-Handed Acoustic-Electric is another acoustic electric hybrid that brings the signature Ibanez focus on tone and technique to the fore. It has a cutaway, a port for an amp, the same wood construction as most acoustics and Fishman pickups. 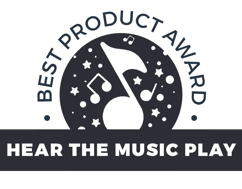 The big difference is a preamp with its own equalization tools. That shows a real commitment to the electric half of the instrument. It also gives you a greater degree of control over the sound signal that comes out. At $430, it is not the most affordable option, so make sure you want to play it through an amp regularly. Now that you know what to look for, you should be able to find the best left-handed acoustic guitar for your budget. Whether you want to spend a little or a lot, one of these guitars will work for you.